The battle over the ultimate fate of 101 digital billboards in Los Angeles took a turn last week when the City Attorney’s office said that Clear Channel and CBS Outdoor could legally restore the signs to their original, non-electronic state. The opinion came in a response filed in Superior Court to a motion seeking to order the complete demolition of the billboards, all but two of which have been dark per court order since last April. Summit Media, the small billboard company that successfully sued to overturn the 2006 deal by the City Council giving the companies the right to convert 840 billboards to digital, is arguing that the two billboard giants have lost their right to operate billboards of any type at 99 locations. That argument is scheduled for airing Sept. 16 before Judge Terry Green, who issued a “pull the plug” order after the California Appeals Court ruled that permits issued in 2007 and 2008 for the digital billboard conversions were invalid. The response filed by newly-elected City Attorney Mike Feuer says that Clear Channel and CBS Outdoor can apply for permits to return the digital billboards to their original state. If the companies wanted to leave the digital faces in place they could legally wrap them with vinyl advertising, the response says, although doing so would require a public hearing before the city’s Board of Building and Safety Commissioners. The City Attorney’s opinion sharply contrasts with the Summit Media motion, which argues that even though the original billboards held “non-conforming” rights after the city passed a ban on new off-site signs in 2002, those rights were lost when the digital conversions were deemed invalid, first by Judge Green in 2009 and late last year by the California Appeals Court. Note: The Coalition to Ban Billboard Blight has submitted an Amicus brief to the judge supporting Summit Media’s position. 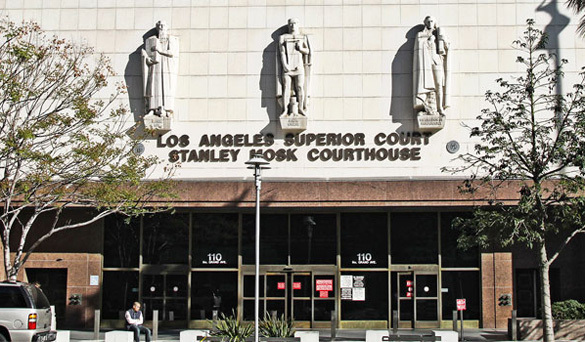 The City Attorney’s response to the Summit Media motion came a week after Summit’s attorney sent the office a letter accusing the city of violating those court orders by failing to force the removal of the digital displays and supporting structures. In his letter, attorney Timothy Alger cited a section of city ordinance that allows “non-conforming” signs to be continued provided that no structural, electrical or mechanical alterations are made to the signs. Almost all billboards in the city became “non-conforming” when the City Council adopted the off-site sign ban. In converting their billboards to digital, Clear Channel and CBS completely removed the sign structures above their supporting columns in order to install the digital panels. The conversions also required new electrical services, and in some cases, foundation reinforcements to support the added weight of the digital displays. Alger concluded his letter by saying that Summit Media intends to seek a court order to show why the city should be held in contempt of the rulings by Judge Green and the appeals court.